Who is thankful for you? If that’s how they talk to each other in public, I thought, I can’t imagine how they speak to one another at home. I was at the grocery a few days before Thanksgiving. Another middle age couple passed by, arguing over a seemingly inconsequential subject. Neither spoke kindly to the other. Playing out a well-worn script so viciously, they obviously have said the words before. I couldn’t imagine living in their home. We all can suppress or fail to express feelings of affections. But into that vacuum, too many expel emotions that are unkind, hurtful and not of God. And like all forms of abuse, like open fires, the words harm those closest. Even the best Christians, those singing the loudest in church every Sunday, can be emotionally abusive at home. Isolating and isolated. This is not of God. People can project the perfect public persona, and yet be unkind to those they claim are the most important. God is love. God loves you. If you are not treated thankfully, it is not of God. Life is difficult enough already without surrounding ourselves with hurtful or ungrateful people. Does your husband show gratitude for his children? For your selflessness? For the home you make? Does your wife acknowledge and recognize your efforts? Your sacrifices? Do your co-workers appreciate your talents, and treat you respectfully? The day after Thanksgiving, I saw a couple in their early sixties, arguing 20 feet apart, not to the level of domestic disturbance, but to a level that crushes the soul God put in them. I’m ashamed to admit, sometimes in the past, I spoke to loved ones unkindly. Even after I found Christ, I did not regularly speak to my spouse with kindness. To this day, I don’t communicate feelings of gratitude the way I’d like, and so I try harder to let people know I am thankful for them. As Paul told the church in Thessaloniki, in his oldest, surviving letter, “Rejoice always, pray without ceasing, give thanks in all circumstances; for this is the will of God in Christ Jesus for you.” If you are not thanked, if you can count your few reasons to rejoice, this is not of God. If the people around you don’t make you feel good, and feel good about yourself, then the relationships are not of God. Good can come from bad, like strong trees growing from ill-treated seeds, but that is God working despite our relationships, not working within our relationships. God wants you to be happy — not dedicate your energy to people and situations that drain the essence of who God made you to be. God created you to love and be loved. That is God’s will for your life — to love and be loved. 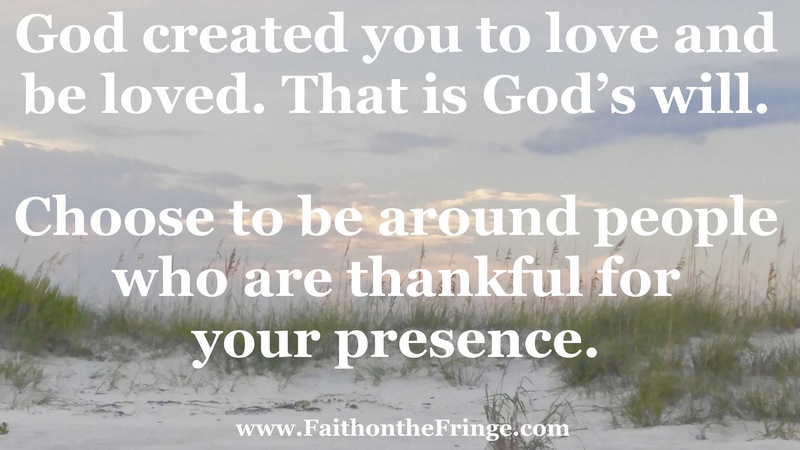 Choose to be around people who are thankful for your presence. Be with people who want to talk with you and hear you talk. Move away from toxic relationships that are not of God, and focus on the positive. Connect with people authentically, and you will be restored to who God made you to be — your authentic self. God is in the positive moments. Seek out the positive moments until your life is overflowing. Christ came so that you might have life and have it more abundantly. Live an abundant life of love. Live your life with joy and with people who are thankful for you. This is God’s will for our lives. This entry was posted in culture, Faith, Uncategorized and tagged counting our blessings, Faith, family, God's Love, marriage, respect, Thanksgiving. Bookmark the permalink.